Hidden on a ridge high above Clapham Bottoms is an insignificant looking shakehole which, since 1947, has been christened 'Body Pot.' The story surrounding it is one of the macabre mysteries of the Yorkshire Dales and is unlikely ever to be solved. Body Pot is one of a series of small potholes found on Clapham Bottoms, an undulating area of limestone between the famous gorge of Trow Gill and the wild moorland of the 'Allotment' on the south eastern slopes of Ingleborough. Close to Ingleborough Cave, this steep path heads out of the meltwater valley of Clapdale and takes the explorer up to Long Lane, an alternative high level route up from Clapham. Once the stile is reached (top of picture) the route lies to the left, following the wall up to higher ground, where few people, except farmers and cavers, ever tread. Clapdale Farm, formerly the fortified manor house of Clapdale Castle, the seat of John de Clapham in the 14th century: a supporter of the Earl of Warwick. This view is from the Long Lane route to Clapham Bottoms, accessed through tunnels in Clapham village created by the Farrer family. The farm ingeniously draws water from the beck far below using a 'ram pump' which forces the water up the steep hillside. Ingleborough Cave, viewed from the vantage point of Long Lane. Once known as Clapdale Great Cave, it was made accessible in 1837 when James Farrer ordered a stalagmite barrier to be removed, releasing an underground lake. Only after 146 years of trying was the link to Gaping Gill finally confirmed when, in 1983, divers made the connection. Looking back from the steep path linking Long Lane to the route through Clapdale. Trow Gill and Gaping Gill lie straight on, while the trees to the right screen another route to Clapham Bottoms. This attractive dry valley was widened by meltwater at the end of the last glaciation. 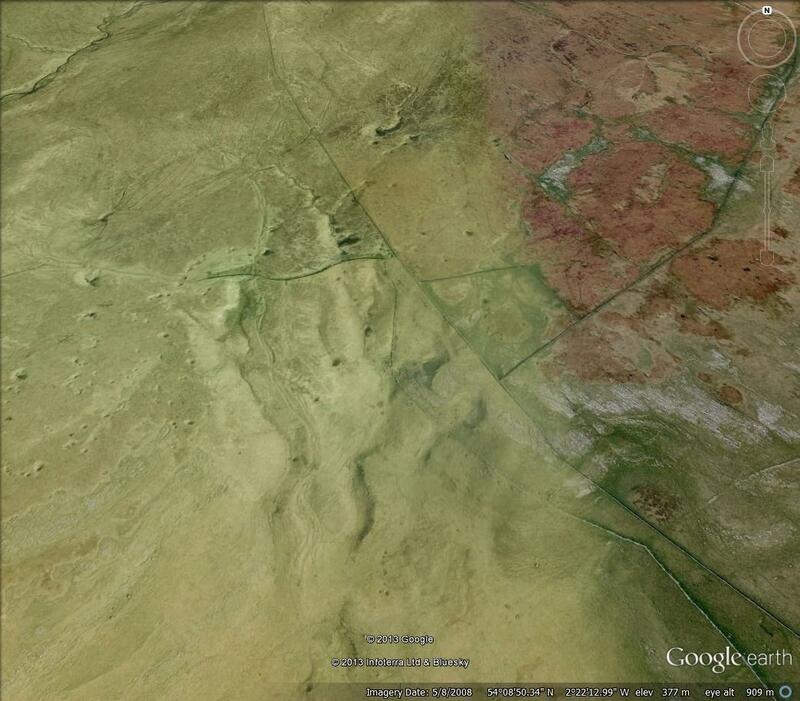 Hundreds of feet below the grassy slopes in the centre of the image lie the far reaches of the Gaping Gill system. Small scars and boulders of weathered Great Scar Limestone reveal themselves as the rough path winds its way up through Clapham Bottoms. Looking back down the appropriately named Long Lane towards Clapham. The limestone benches of Thwaite Scars, up on the left, together with the width of the valley, merely indicate the sheer dimensions of the glacier that flowed down here during the last ice age. 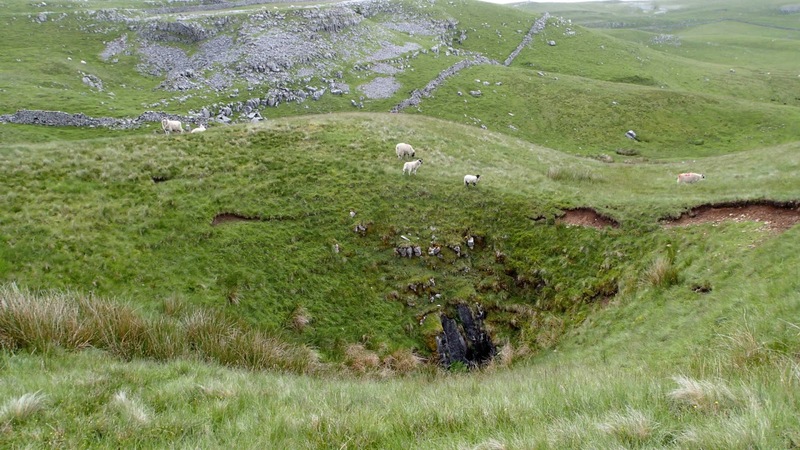 During the ice age, the great shaft of Gaping Gill was plugged by ice and glacial debris. Towards the end of the glaciation, as the ice began to thaw, torrents of meltwater couldn't access Gaping Gill and so famously carved out Trow Gill - as seen here, over thousands of years: the classic example of a meltwater gorge. Today it has been left dry with the water once again finding its way through the Gaping Gill cave system. Looking along Clapham Bottoms, where dolines (subsidence or solution depressions) give some indication of the activity deep beneath the surface. The suspected 'Clapham Bottoms Master Cave', despite years of exploration has, as yet, not been discovered. Bare, exposed rock and emerald green turf are characteristic of limestone country. Extensive view towards Thwaite Scars on the left and the woodlands of Trow Gill on the right, with the Bowland Fells beyond - their darkness contrasting with the limestone landscape. Dry valley in the upper reaches of Clapham Bottoms - probably representing a former post-glacial stream channel that has since found a new route underground. There are many such features in the area. Scars like this one have been left exposed by water action on either side of more resistant rock. At noon they came across this feature - a deep shakehole in an unusual position on a ridge, and very easy to miss. The bottom was full of nettles and small boulders barring the way into an obvious cavern. The ridge containing Body Pot can be seen very well at the centre of this photograph. A line of rushes marks the 'sink' into the hole which can still be quite powerful in flood conditions. Ingleborough and Little Ingleborough dominate this view, looking north west. Jim no doubt tackled the nettles before crawling inside, with Budge following him. Removing a few small boulders, they descended into a small chamber, and, on climbing down, noticed a pair of shoes protruding from beneath a large rock. Seconds later it was apparent that the shoes were in fact attached to a skeleton. The body was mainly decomposed and .. as though the find wasn't daunting enough ... the skull had a plum-coloured scarf knotted around the mouth and wore a trilby hat. Not only that, but there was evidence that he had, in fact, been 'walled-in' to a cavity - and beside him was a bottle of the lethal poison, sodium cyanide. This is how the interior of 'Body Pot' appears today. The body was found in this area. The man was forensically examined and was seen to be 5 feet 5 inches tall with sandy hair. He was estimated to have been dead between 2 and 6 years. The body was found not only with the poison, but with a toothbrush, spare pair of shoes, a wristwatch, handkerchief, shaving tools, toiletries and flashlamp. He also had money totalling 11 shillings with coins all older than 1939 and a key was discovered in his rotting clothes. Jim and Budge had made a startling discovery and investigations went on for months. The entrance passage quickly turns left into the chamber where the body was found in an alcove. Recent digs in an adjacent chamber have probably concealed the actual stone under which the body was concealed. Looking back from the 'Body' chamber to the entrance slope of somewhat precarious boulders. It doesn't take much to imagine a pair of feet sticking out from beneath one of these boulders! Animal bones cause one to shudder for a second or two .. Looking into the scaffolded 'dig' of the second chamber. The scaffolding supports dangerous boulders and it is best left well alone. Despite the macabre story - there is beauty in Body Pot, too. The delicate ribs of wonderfully eroded limestone making up the ceiling just inside the entrance are particularly attractive. The area of Body Pot as seen from the north. It can be seen from this picture that such a location was well chosen for the resting place, whether or not the man was murdered or, indeed, took his own life. The hollow - at centre - is well hidden from all sides, with the entrance - though close to a track, not particularly conspicuous until an explorer is right next to it. Was the man a German spy? Was suicide involved? Was he a paratrooper who had 'bailed out' over Britain? How was he 'walled-in' if it was suicide? Why was the cyanide bottle presumably full with no evidence of it having been used? Was this a genuine murder case? These questions have, to this day, never been answered. Interestingly, another body was found in Gaping Gill at around the same time, but was proven to have been undiscovered for considerably longer than the man in Body Pot. Both matters remain, perplexingly, a complete mystery. On the return from my wander to this macabre spot, I passed by Clapham Bottoms Pot - once known as the Bradford Folly from an unsuccessful attempt by the club many years ago to connect it with the far reaches of Gaping Gill. It is surrounded by a low wall and is unsafe at present with loose boulders. Cavers, as can be seen from the photograph - are doing their best to keep working at it. There are several underground pitches and squeezes leading into chambers, and the pot clearly has some potential. The entrance shaft, which has been considerably excavated to wide dimensions, is covered by planks to prevent sheep falling in, as the old wall is unlikely to be of much use. Another lovely limestone outcrop near Clapham Bottoms Pot. The Mystery River: Clapham Beck making its journey down Clapdale having just emerged from its subterranean course at Clapham Beck Head. It takes several days to make the journey from dropping down Gaping Gill as Fell Beck to its emergence into daylight, and much of its activity underground still remains a mystery. Limestone country never fails to astonish those who explore it. Clapham Bottoms and the Allotment from the air. The Allotment is the reddish expanse of moorland at top right. The major hole at top centre is Marble Pot, and next largest on the photograph across the wall and down to the left is P5. Just below P5 is a wall running east/west and over this wall two obvious small holes can be seen darkly in the picture, lined up diagonally. Body Pot, where the skeleton was discovered, is the lower (south-west) of these two holes (SD758724). If you wish to follow Jim and Budge's footsteps, take a caving helmet and lamp, and have a change of clothes in the car at Clapham. The hole is dangerous and there are many unstable boulders, so entry must be made at your own risk. You actually don't need to enter to get a good overall feel of the place. The prominent hole at the extreme bottom of the picture and slightly to the left is the walled entrance to Clapham Bottoms Pot. (do not on any account be tempted to enter this one) This little wander makes a good day out combined with a visit to Trow Gill and Ingleborough Cave, and gives a good understanding of the karst landscape. I would like to say a special thank-you to John Cordingley, whose knowledge of the dales is second to none - for helping me in so many ways with this project and making sure I picked out the correct pothole from a confusing mass of possibilities in Clapham Bottoms!! This page wouldn't be what it is without John's help. Highly interesting, and as you say if he chose this out-of-the-way place to commit suicide, how did he come to be walled in. I would like to know if all the clothes, toothbrush etc were of British manufacture, although I know that foreign spies took great measures to ensure they weren't carrying anything which was a giveawy that they weren't British. All the money being pre-1939 might indicate a foreign agent, if these were the only British coins that were obtainable. However I don't think much money was minted during the war itself. I am also intrigued by the Gaping Gill body, found at the same time, but apparently unconnected. Was this a hapless caver on a solo trip? I have been down Gaping Gill on the winch and was shown the spot where that body was found - it did not seem to be a spot where someone would land if they fell down the hole, yet one could not survive such a fall and crawl away. Perhaps he enterred by another route such as Bar Pot. And I was told he was headless.